Thread for GBP/USD discussion - latest news, technical analysis, forecasts and opinions. That was your right thinking about the pair. Because of Brexit and few high impact news still, keep the pound in a strong position at up side. Last week USD data was so good but that could not make strong USD against GBP. 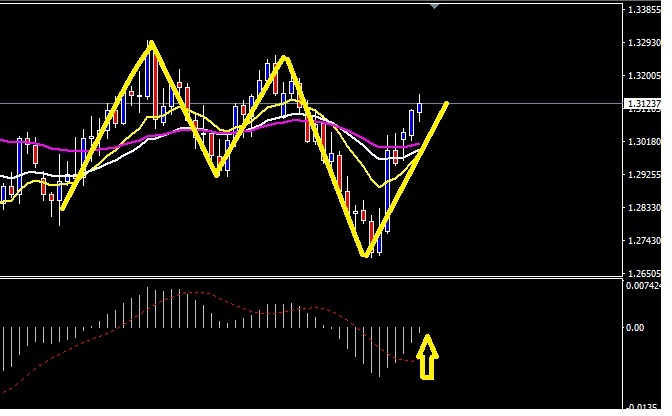 This pair builds up M pattern and V pattern in a d1 chart. A couple of bullish movement price brings at a zero value of MACD. GBP/USD will reflect the recent landing look in case of a return to stability the highest level of psychological resistance 1.3000 the following levels of resistance to the pair will be 1.3085, 1.3160 and 1.3275 respectively, which confirm the strength of the correction upward. Stability below 1.30 will support continuous movement in a bearish channel and will then prepare the following levels of support for the husband 1.2920, 1.2840 and 1.2770 respectively, which are the levels of consolidation of the downward power of the pair. GBP/USD price will reflect the last landing look if it returns to stability the highest level of psychological resistance 1.3000 the following levels of resistance to the pair will be 1.3085, 1.3160 and 1.3275 respectively, which confirm the strength of the correction upward. Stability below 1.30 will support continuous movement in a bearish channel and will then prepare the following levels of support for the pair 1.2920, 1.2840 and 1.2770 respectively, which are consolidating the downward power of the pair. GBP/USD trades positively to continue to fluctuate at 1.2900 level, while the stochastic begins to gradually lose positive torque, keeping our expectations of downward trend dependent on stability below the 1.2962 level, while the main objectives are expected to be at 1.2800 then 1.2700. GBP/USD rises to the 1.3047 resistance level, which also coincides with moving averages of 200 and 50 periods, making it a critical level in determining the general bias of the currency. The penetration above this level would be tantamount to a shift in the pair's bias from the downward trend to the upward trend. In addition, the breakthrough above this level will pave the way for the next major resistance level at 1.3170. On the other hand, if the morale continues to decline and negative news is announced for the "Brexit ", the pair will penetrate the MA periods and return to the 1.2806 support level. GBP/USD was subjected to strong negative pressure after the resignation of the minister of "exit from Britain " shortly before, prompting the price to break the 1.2962 level followed by 1.2800 and settling below the last level, noting that the price may face further decline during the coming period. Now, we prefer to stop the neutrality until we get a clearer indication of the next direction and stabilize the pair's mixed movements. GBP/USD price was recently broken below the 1.2806 support level to reveal the next major support level at 1.2729. The bias of the pair is still bearish due to the negative worldview surrounding the Brexit agreement. Traders should note, however, that if prices fall above the 1.2806 level, prices may rise to a moving average of 13 periods before continuing to decline at a later date.